Common knee injuries vary from minor falls which may settle down in a few days to major accidents which may take months to recover from. The knee ligaments and cartilage are the structures most commonly damaged. Here you will find information on the most common knee injuries including how they occur, the knee injuries symptoms for each one and treatment information. There are 4 ligaments in the knee, which work in the pairs. The anterior cruciate ligament and posterior cruciate ligament control the forwards and backwards movement of the knee and are really important for providing stability. 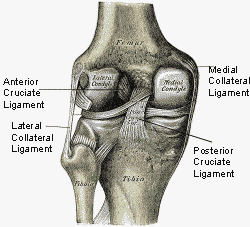 The medial and lateral collateral ligaments provide sideways stability for the knee. Ligaments are usually injured either by sudden twisting movements, or when a great deal of force goes through part of the knee e.g. from a sporting tackle. They are the most common knee injuries in sports. Treatment: Exercise rehab and/or surgery. Treatment: Knee brace, physical therapy and/or surgery. Treatment: PRICE, exercises, knee brace. Treatment: PRICE, exercises, knee braces. The knee joint is lined with 2 types of cartilage, articular cartilage which lines the bones, and then a second special layer of cartilage known as the meniscus. The meniscus works like special cushioning to reduce the force going through the knee bones. Treatment: PRICE, exercises, knee brace, tubigrip, sometimes requires surgery. Can take a long time to heal. Treatment: PRICE, exercises, tubigrip, sometimes requires surgery. Visit the Calf Muscle Strain section to find out more. Kneecap problems are less common knee injuries as they require a great deal of force through the knee. 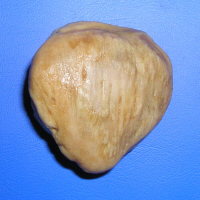 What is it: When the kneecap bone breaks into two or more pieces. Causes: A great force through the front of the knee e.g. falling from a height or impact from a car crash. Treatment: May require surgery, exercises, knee brace and/or cast.